When you first come to Alaska, it’s easy to fall in love with the big things: mountains, rivers, 20 hours of daylight … but it takes a little longer to learn and love all those little that make Alaska so fantastic. One of those on my list has got to be spending an hour listening to the radio. In that one hour, you’ll hear ads and information for The Fishing Widow (Copper Center), Fish Central and Pangaea Adventures (Valdez), the 2008 Iditarod (Anchorage and Wasilla), and a whole lot of static. I love that it’s as if one radio station covered both Milwaukee and Minneapolis (my neck of woods), or reached audiences from Los Angeles to Las Vegas. Where else but Alaska are people so intimately connected in the midst of such a vast area? 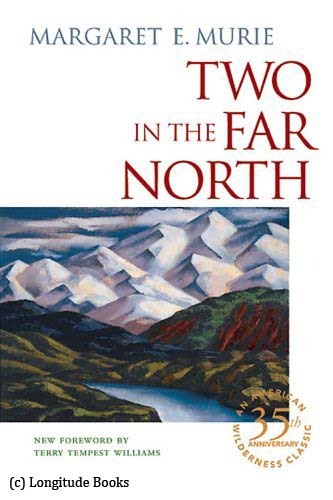 That interconnectedness reminds me of the books I’ve enjoyed this summer – books such as Samme and Aileen Gallaher’s Sisters, or Margaret Murie’s Two in the Far North; they tell the stories of some of the first first-time visitors to Alaska, and in the recollections of these long journeys across the North you see the bonds made between people as far separated as Seward and Fairbanks … and with no radio at all!